← Have you made your fruitcake yet? I love cherries, but let’s be honest, the pits are a real issue. Now, I’m willing to commit to some lingual gymnastics when eating fresh ones, and actually that’s a skill set that can come in handy. Hypothetically speaking, say you’re having a pleasant evening in a bar but realize you’re a bit short on cash and suspect your cards will go all code red if swiped even one more time. 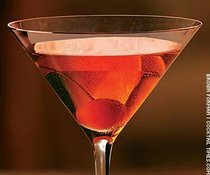 Quite often, I have heard, the ability to tie that maraschino cherry stem from your Manhattan into a knot using only the tongue can be parlayed into a side bet that yields adequate funding for another round. In my younger days, I might have seen or heard of such behavior, but these days, well, anyway, let’s move on. Buy 'em by the sack! So, recently I was visiting Costco with a friend (and mooching off her card to buy industrial size boxes of fabric softener and Cheerios, I’ll admit) and I stumbled upon these huge bags of dried cherries. I had been buying them at the gourmet grocery for upwards of $20 a pound, but here they were at Costco (and at various sites on the web) for less than $10 a pound. And they taste as good as the high end ones. Happy day! Let me tell you, dried cherries are the greatest things to have on hand. Tart, sweet, chewy and delicious. You can put them in your oatmeal, add them to brownies or chocolate chip cookies or apple pie, toss them in salads, or just pop a handful in your mouth when you need a little something sweet. Posted on November 28, 2011, in Breakfast, Dessert and tagged Cherry, Drink and Food, Humor/Commentary. Bookmark the permalink. 2 Comments. Loving your posts! BTW, cherries are great for gout. And just for the record, I brine! There is not a slatternly bone in your body, my dear.